Opera Ontario has begun its 23rd season with a superb production of Puccini's "La Bohème". "La Bohème" is, of course, the most-often performed opera in the world and has been produced by the Hamilton-based company three times before. But this new production miraculously has no hint of the routine about it. An insightful director and a young cast of excellent singers make this familiar work feel like new. The most difficult aspect of "Bohème" to capture is its simplicity. The plot is one of the most straightforward in all opera. The characters are uncomplicated and while their emotions may be momentarily confused the confusion is soon resolved. In an opera where the poverty defines the characters' actions and outlook, grandiose productions, like Franco Zeffirelli's for the Met, entirely miss the point. The characters fall in love, laugh and pretend despite their circumstances, and the harsher these are made to seem, the more poignant the action becomes. The sets borrowed from the Virginia Opera atmospherically lit by Stephen Ross and the costumes coordinated by Ed Kotanen shift the action forward from Paris in the 1830s of the original to Paris under the German Occupation in the 1940s. Straighter lines and a grimmer reality replace picturesque petticoat and frockcoats. Radio broadcasts (not overlapping the music) directly affect people's lives. This setting immediately expands the feeling of restriction and poverty from the artists' world to that of the whole citizenry. It adds a political dimension to the work when Musetta's wealthy benefactor becomes a high-ranking German officer and a sense of menace to Act 3 when the usual tollbooth becomes passport control run by an enemy forces. Setting Act 4 after the Liberation of Paris lends further irony to Mimi's death. Director Jeannette Aster has drawn highly detailed performances from the entire cast and chorus. She is sensitive not only to the words sung but to the dramaturgy inherent in Puccini's music. She manages the complex action of Act 2 at the Café Momus superbly, making clear the interplay of the simultaneous onstage events. Aster's is the most natural and incisive stage direction I've seen at Opera Ontario. I hope we will see more of her work there in the future. Such careful direction would go nowhere if there were not a cast able to carry it out. The chief delight of this "Bohème" is that the principals are fine actors as well as marvellous singers. Soprano Sally Dibblee, last seen in the company's excellent production of "Susannah" in 1999, returns to play her first Mimi. Again she enchants with the purity of her tone and her amazing vocal control. Her pianissimos are heavenly. Mimi can often seem generally weak and passive. Dibblee makes Mimi much more interesting by showing that under her shyness Mimi has a strong character struggling to free itself from the restrictions her disease places on it. Quebecois tenor Marc Hervieux plays Rudolfo. What a discovery! Not only does he have a full-blooded Italian tone and power to spare but, unlike many in this category, he can act. This is especially important in a work like this so dependent on carefully observed nuances of feeling. He invests "Che gelida manina" in Act 1 with a more complex mixture of emotions than is usual and the jealousy he shows in Act 3 is tempered with an awareness of its injustice. He's definitely someone to watch. Canadian Gregory Dahl is already well known. He brings his full, rich baritone and finely honed acting skills to the role of Marcello. His performance is so strong that the Marcello-Musetta relationship becomes not merely a diversion but the parallel contrasting plot it is meant to be. For her part, Albanian soprano Mirela Tafaj, making her Canadian debut, is a vivacious Musetta. While her voice tends to blend with more than rise above the orchestra, her acting ensures a clear projection of character. Dion Mazerolle's light, firm baritone makes a memorable character of the easy-going Schaunard. 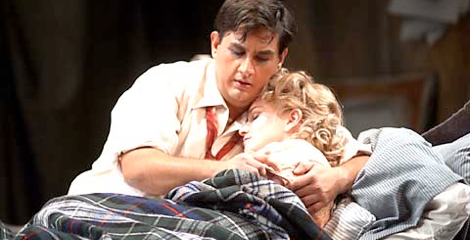 Great Quebecois bass Joseph Rouleau, coaxed out of retirement for this production, makes two contrasting roles--the easily duped landlord Benoit and Musetta's wealthy admirer Alcindoro--so distinct you'd think the two are played by different singers. His sonorous voice is a delight. In contrast, Ukrainian bass Alexander Savtchenko as Colline certainly looked the part of the bear-like philosopher, but his intonation is unclear and his diction imprecise. Tenor Sarkis Barsemian is an attractive Parpignol. Opera Ontario Artistic Director Daniel Lipton conducts very gratefully for the voice. Though his tempi became slower for the second two acts, the orchestra and singers responded with greater intensity. Throughout he makes clear the minutely detailed relation of the Puccini's music to the words sung and the action onstage. Under him the Hamilton Philharmonic Orchestra produced a gorgeous sound. This production succeeds by paying such close attention to what Puccini's music is actually saying. While it's not difficult come across productions of "La Bohème", it is difficult to find one so clearly and insightfully staged as this. With such fine talent on display it's more than worth the journey. Photo: Marc Hervieux and Sally Dibblee. ©2002 Opera Ontario.